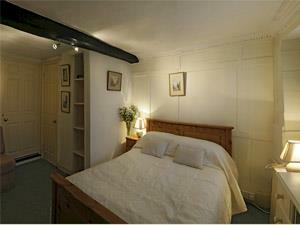 Ground floor room with one double bed and sofa bed for one adult or two small children. Connecting door to Room 16 available to provide suite of two rooms. Rates include a buffet breakfast and VAT. Well-behaved dogs are welcome @ £15 per night. A limited number of secure parking spaces @ £25 per day per car. Larger vehicles and vans will be directed to private off-road parking about seven minutes walk away. Bookings made online will attract an administration charge of 2%.